Knights have invested in watercoolers from AquAid. purchase an automatic donation is made to the Africa Trust. These funds are used to build ‘Elephant Pumps’ - a modified version of an age old Chinese rope pulley system. One such pump is currently being installed in Africa on our behalf and it will be a much needed source of clean and fresh drinking water for many. What the team is known for: Experienced rural team with links to key agricultural organisations. Particularly active in the area of field sports and also regularly represents clients in disputes. Clients include farmers, businesses and estates. Strengths: An interviewee says: "Knights know this subject well. They give you a balanced view of the risks involved in addressing a rural dispute." Significant clients: National Farmers Union, Tenant Farmers' Association, National Gamekeepers' Organisation, Game Farmers' Association, National Small-Bore Rifle Association. Notable practitioners: Founding partner Matthew Knight is well known for his expertise in contentious rural matters, particularly those relating to field sports. "He's the best man for the job on hunts and animal welfare," says one source, while another interviewee describes him as "very good on regulatory matters." Matthew Knight is listed in elite “Leading Lawyers” list, The Legal 500 United Kingdom 2017’s guide to outstanding lawyers nationwide. We are delighted to announce our recent certification. Cyber Essentials helps prevent the vast majority of cyber-attacks. Having a Cyber Essentials certification helps to protect our firm against common cyber threats and it demonstrates to our clients that we take this issue seriously. Matthew Knight has been interviewed for the BBC South East regarding Allied Care Limited and Payzequra of Wyoming. A video of the news section can be viewed here. A long-standing client of Knights has featured in the Kent Life news for their charitable work done for the Manchester One Love concert. The article can be read here. 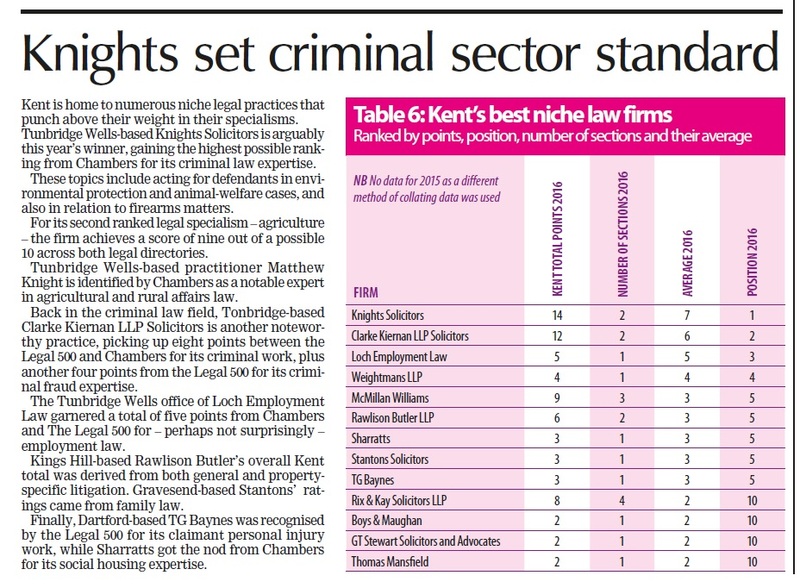 The team at Knights are proud to be listed as Kent’s best Niche Law Firm. We are delighted that our expertise and excellent client care have been recognised. The full article, which featured in The Times of Tunbridge Wells 1 February 2017, can be read here. Merry Christmas and Happy New Year from all at Knights Solicitors. The firm will be closed for the Christmas Holiday from close of business on Friday 23rd December 2016 until 8.30am on 3rd January 2017. During this time, as always, our Legal Helplines will remain open. We are available to assist you in any urgent matters and will have staff on standby to open our offices to facilitate meetings if necessary. Please contact us on 01892 537311. Matthew Knight, Senior Partner of Knights Solicitors, has given an interview to the BBC regarding the treatment of Ponies on Dartmoor. Knights Solicitors are pleased to announce that they will be sponsoring the NFU Kent Annual General Meeting on Tuesday 7 December 2016 at 8am. Speakers will be Chris Mead; Kent's leading agronomist and Ian Morris of Chavereys. The topics of discussion will be Brexit and Glyphosate and Pesticide developments. Please contact your local NFU office for further details. Knights Solicitors in Tunbridge Wells have secured membership to the Law Society’s Conveyancing Quality Scheme – the mark of excellence for the home buying process. Knights underwent rigorous assessment by the Law Society in order to secure CQS status, which marks the firm out as meeting high standards in the residential conveyancing process. CQS is the well-established quality kite mark of the residential property services market and it enables clients to identify and recognise practices that provide high quality residential conveyancing services. Graham Dorman, Head of Conveyancing and Non Contentious work at Knights Solicitors says: ”We are delighted to have secured CQS membership; we know that buying and selling property can be a stressful experience but clients can be confident that by choosing Knights Solicitors, they can be sure of a safe, efficient and personal service of the highest standards”. The Law Society introduced CQS to help recognise high standards in the home buying process. It requires practices to undergo a strict assessment, compulsory training, self-reporting, random audits and annual reviews in order to maintain CQS status. It is open only to members of the Law Society who meet the demanding standards set by the scheme and has the support of the Council of Mortgage Lenders, the Building Societies Association, Legal Ombudsman and the Association of British Insurers. Knights Practice Manager, Colette Chapman, commented: “securing CQS status, together with our Lexcel Practice Management accreditation, clearly demonstrates our commitment to our clients”. Please contact Graham Dorman, Head of Conveyancing Department at graham.dorman@knights-solicitors.co.uk or call on 01892 537311 for your conveyancing requirements. departments which gives assurance that a practice meets high client care and business management standards. necessary for L to have an EPC (Energy Performance Certificate) provided in respect of the property and must provide a copy of the EPC to T.
after the expiry of the first four months of the term. Previously many Ls would hand to T the Notice requiring possession – known as a Section 21 Notice – at the same time as entering into the Tenancy Agreement. January 2016 sees the introduction of Knights Family Law Department with the arrival of our new Associate Vicky Gallier, who will be heading up the department. Vicky is a very experienced family law and divorce and children litigation solicitor whom we are very pleased to welcome to our firm. She brings with her, extensive knowledge that will enhance our current range of expertise. You can read more about Vicky and her experience in the ‘Our Team’ section of our website. In recognition of his contribution to the firm and his enormous talent and potential, we are proud to announce that Joshua has been appointed partner of the firm from 1 January 2016. Joshua continues in his role of successfully assisting clients in civil litigation matters. He will also take over the running and development of the Criminal and Regulatory practice assisted by Richard Atkins. Richard has decided to reduce his role with the firm from 1 January 2016 but we are delighted that he continues with Knights as an associate and will carry on assisting Joshua Quinn with the very successful criminal and regulatory practice area of the firm. We also launch and introduce Knights Legal Help Desk, which is designed to help you make the right decisions. Matthew Knight, Senior Partner at Knights Solicitors who specialises in gypsy and traveller issues, has warned that changes in the law are having a profound effect on the way local authorities manage residential sites under their control. Now that new legislation has come into force, he urges council officers to be particularly aware of how this will change the way they carry out their duties. We determine whether your problem requires a legal approach and advise if it is possible to solve by taking another route as part of our highly recommended services. Consultations can also be conducted by telephone when that is your preference. Please call us on 01892 537311 to make an appointment. Contact us today, in Tunbridge Wells, Kent, for more information about the services provided by our law firm.